The Senior Design Research Studio concentrated on wicked problems and using Transition Design as a mode for intervention. A wicked problem is one that can never be completely solved. It is multi-causal, multi-scalar, and interconnected with other wicked problems. For the first half of the semester, I worked on research related to access to affordable food in Pittsburgh. This initial research was an introduction to the wicked problems plaguing our society and how the methodology of Transition Design could be a way to plan future interventions. My team came together as a self-defined group based on new awareness and interest - each of us bringing deep knowledge about gentrification, access to food, access to affordable housing, and air quality. to no say in the change occurring around th em and their subsequent displacement. • 50% of Pittsburgh residents live in afood desert. • Public transportation is frequently cut off or unreliable throughout thecity. • There isn’t sufficient education available for residents about finding affordable housing. • Pittsburgh residents and companies do not realize their negative impacton air quality. Through open discussion and consideration about these problems, we noticed that they were linked to early behavior and habits. Bringing understanding and empowerment surrounding the state of Pittsburgh early in a citizen’s life would be an effective way to plant seeds for longer-term change. 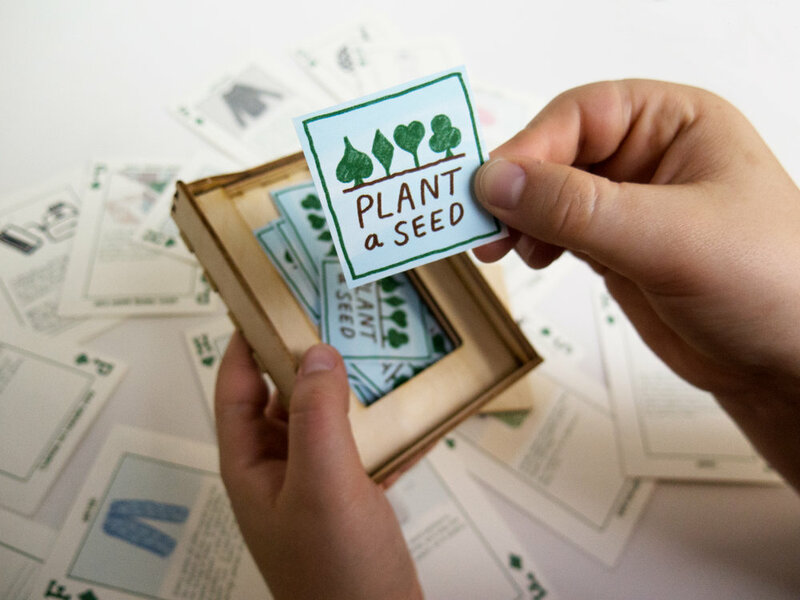 Plant a Seed is a movement, and this physical card deck paired with a virtual Snapchat experience were the first of a hypothetical series of interventions. In order to determine what must happen for our preferred future to occur, we placed present day events on a timeline along with our hopes for 2050. We were then able to backcast to the present to identify what types of eventwould need to happen along the way. STEEP forces (social,technological, environmental, and political) were used toorganize the events and ensure a range of facets were takeninto consideration. The Three Horizons Model of Change was used to map our preferred future with more depthand specificity. The model looks at the present and a future and questions what might happen in between. This exercise was used to map out our key stakeholders, their needs, and whether or not they are currently satisfied. Max Neef ’s Universal Needs were referenced because each need will exist in every human no matter which generation they belong to, but each need will require a satisfier that is specific to a person’s age, culture, etc. The needs include subsistence, protection, affection, understanding, participation, idleness, creation, identity, and freedom. These are especially important to recognize now that we areconsidering stakeholders across present and future generations. As we dove deeper into our large scale research questions, we identifiedthe challenges surrounding our plan. While we believed it would becompelling to create an intervention for citizens at an earlier age (hence an elementary school curriculum), we recognized that there were human complexities we needed to understand before moving forward. Primarily, why people don’t care about our environment. Consequently, we scaled our vision back to first test our design on our peers. This will be beneficial for two reasons. Because we will be able totake what we learn about humans to move forward with designing for kids. And second, because if we can get older generations to care, they can be advocates in shifts to school curriculums. To gather research from our peers by testing and understanding their reactions to different behavior change methods. In order to move forward with the project, our group needed to adjustour mindset and posture in regards to a design deliverable. The design that we are familiar with often results in a polished solution, but atransition design intervention results in a different kind of a deliverable, one that isn’t entirely resolved. Since wicked problems are so complex,it would be irresponsible to push a solution without extensive research, understanding, and testing. 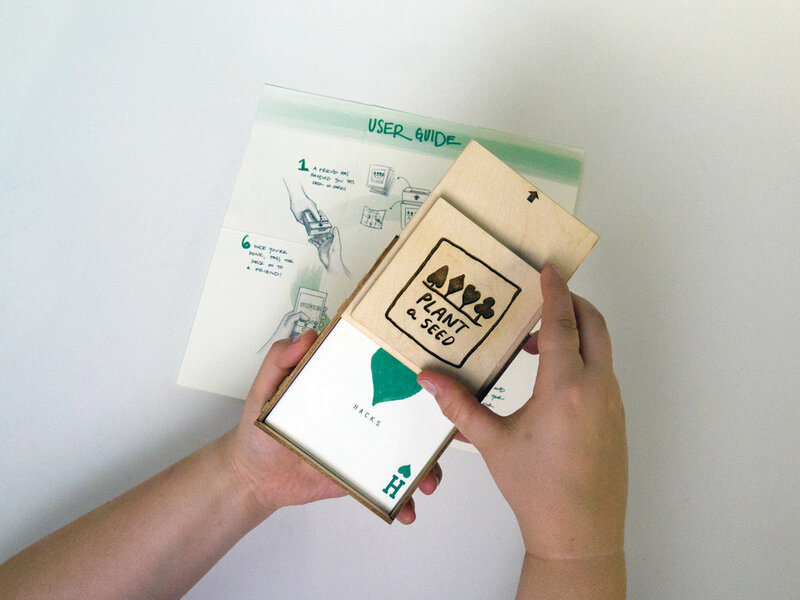 Addressing our first goal (to shift people’s habits), we designed a card deck that would circulate through the Carnegie Mellon community and plant seeds for change. The card deck contains a variety of cards with information about the state of our environment, how we can help, what Carnegie Mellon is already doing to help, and blank cards to provide users with the opportunity to share their own ideas. The deck is passed from friend to friend, slowly but intentionally building a strong community and sharing best practices. To address our second goal (to get feedback), we created a CarnegieMellon Discover Page using Snapchat’s platform. Card users, as well as Snapchat users, in the CMU area are able to discover sustainability resources through a virtual tour around campus. Users are encouraged to use unlock-able filters to share their experiences to the Story. The Snapchat Discover page, virtual tour, and participant Story will give us quantitative and qualitative feedback on people’s reactions. Our Snapchat Discover page takes users on a tour of Carnegie Mellon to find existing sustainable practices around campus. Users can unlock filters and are invited to share their own sustainable habits on their stories and with their friends. To continue this project, we would evaluate, analyze and synthesize our results from the feedback provided by participants. By looking at the results, we might have a better understanding of what compels people to change their habits and what resonated with them about our card deck and Snapchat virtual tour. We would take another look at our large scale vision. When we began the research, our intent was to implement change within elementary schoolcurriculums of Pittsburgh. With this new insight from our card deck and responses from the Snapchat community, we intended to design a second intervention that would resonate with a younger generation. Our next step would be to learn about how children respond to different types of materials and how we could create a program that would engage children in sustainable practices. We would scale up the research and content of our project to see what could be changed now in order to create a more sustainability focused curriculum for the future.